Also known as Long-leaved Bitter Bark, this attractive large shrub to 3–5 m is found naturally along the edge of our local rainforests and in moist gullies in eucalypt woodland. 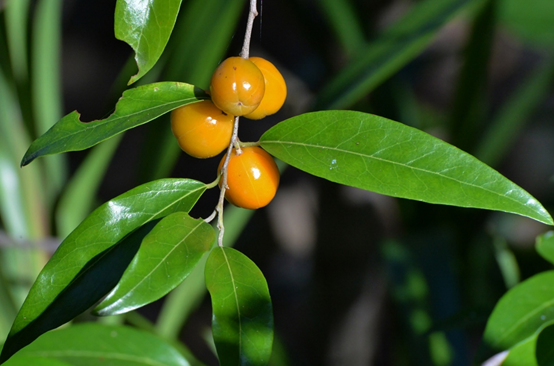 The Quinine Berry has glossy dark green elliptical leaves (which are greyish below) and is one of the host plants for the beautiful Copper Jewel butterfly (Hypochrysops apelles). The creamy fragrant flowers borne in summer are followed by bright orange (inedible) fruits. This is a hardy open shrub that will tolerate most soils. It grows best in full sun, but will tolerate some shade, and benefits from mulching. As well as being an important butterfly host plant, the attractive orange fruits that are held for long periods make this a useful feature specimen for any sized garden.